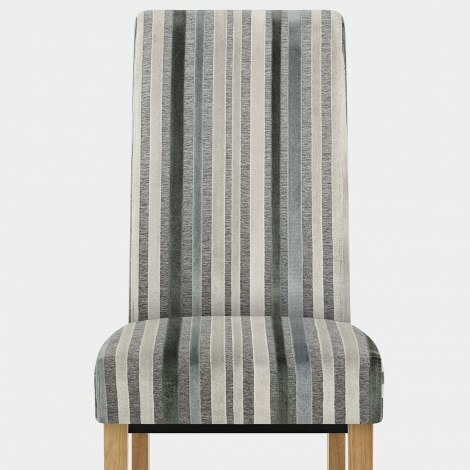 A real refined piece, the Roma Oak Dining Chair Cambridge Stripe will make a tasteful statement in your interior. A traditional design with chic contemporary styling, the Roma will not disappoint. 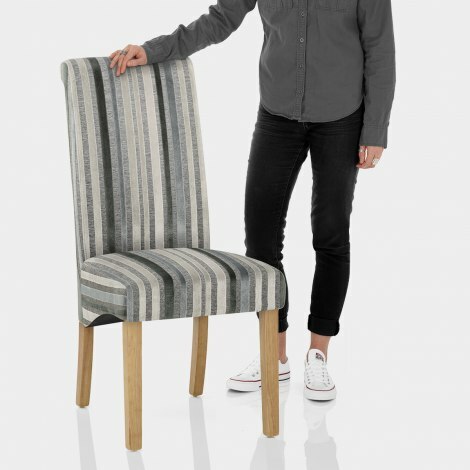 The sprung and belted seat allows you to dine in comfort, and its striped velvet fabric delivers a stylish and eye-catching look. Offering supreme levels of support, the elongated backrest also boasts an elegant scroll design. Crafted from solid oak, the four legs provide a sturdy frame and are complete with floor plugs to aid in the protection of your surfaces. "They look amazing & are comfortable"
This is the second time that we have purchased items from Atlantic shopping and they never disappoint. This company has excellent customer service with great products, Highly recommend. I was totally delighted with my purchase. The quality of the Roma chairs is fantastic and they are so easy to assemble. The whole process from order to delivery was so quick and easy. Thoroughly recommend these chairs as they look very stylish and excellent value for money. So happy with my purchase, cannot beleive how quickly they arrived- 24 hours ! Great quality, fantastic price and true to picture also very easy to put together. They look so expensive and really compliment my dining room table. I would definitely recommend them and use Atlantic again ! 5 stars from me. On receiving the chairs very easy to assemble and they fit in perfectly in the room. Shopped around and couldn't see any dining room chairs I liked as much as the Roma Cambridge. Purchased 6 chairs to go with a heavy oak dining table, went perfectly and are exactly the same as they look on Atlantic website. My mum has the same dining room chairs in the beige shade and they are also really nice. For price and quality they wouldn't be beaten, really pleased with my purchase.